The vibrant, bohemian atmosphere of Paris at the end of the 19th century takes centre stage in a spectacular new exhibition at the National Galleries of Scotland (NGS) , which focuses on extraordinary posters that heralded a revolution in design and the birth of modern celebrity culture. Pin-Ups: Toulouse Lautrec and The Art of Celebrity is the first NGS exhibition to explore the work of one of the most innovative and popular French artists of the era known as the ‘Belle Époque’. Henri de Toulouse-Lautrec (1864-1901) was an outstanding painter, printmaker and caricaturist renowned above all for his immersion in the theatrical and celebrity culture of Paris. 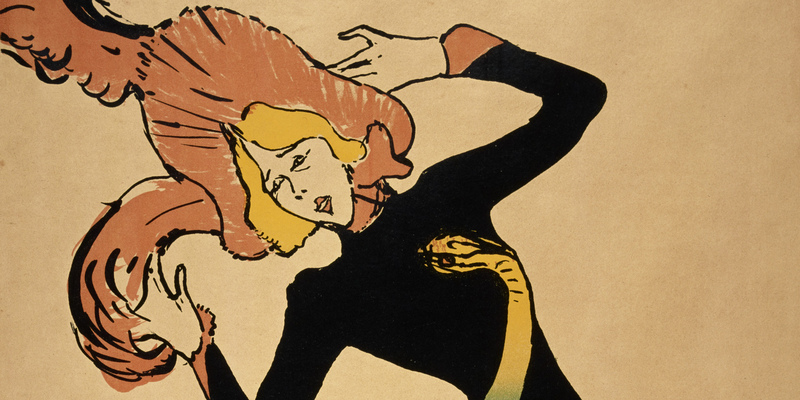 This exhibition brings together around 75 posters, prints, paintings and drawings by Lautrec and contemporaries such as Pierre Bonnard, Théophile Alexandre Steinlen and Jules Chéret, the ‘father of the modern poster’. These include many of the artist’s finest graphic artworks made for legendary nightclubs such as the Moulin Rouge and the Ambassadeurs. The exhibition also includes the work of British artists who were drawn to the dynamic café culture of Paris, such as Walter Sickert, Arthur Melville, J D Fergusson and William Nicholson. Lautrec has long been admired for the startlingly modern posters he designed and for his mastery of the recently developed printmaking technique of lithography. His career coincided with a revolutionary moment, just as the poster emerged as an important means of mass-marketing. Lithography and poster-making were central to his creative process from 1891, when he made his first experiments in the technique. Paris, the 'city of pleasure’, was renowned for its cabarets, dance halls and cafés; most famous of all were the nightspots of the district of Montmartre on the edge of Paris, where Toulouse-Lautrec worked and socialised. Pin-ups will focus on the artist’s lithographic posters, portfolio prints and illustrations which made famous Montmartre’s venues and their stars – personalities such as Yvette Guilbert, Jane Avril and Aristide Bruant. Lautrec was born into aristocracy in Albi, near Toulouse in south-west France. His parents were first cousins, which resulted in serious health problems, most notably a rare bone disorder which halted the growth of his legs and caused him to walk with a cane. Displaying great natural talent, he pursued a career as an artist, receiving training in Paris from Léon Bonnat and Fernand Cormon, and finding his favourite subjects – performers and women working in prostitution – in the vibrant, liberated world of bohemian Montmartre. He exhibited with the Société des Artistes Indépendants and in solo shows in Paris, Brussels and London, but secured wider success and his own celebrity through his lithographic posters. Lautrec witnessed the Parisian demi monde as artist and observer but also as participant, and could be found every night drinking and sketching at his favourite haunts. However, his debauched lifestyle, which included regularly imbibing the notorious (and subsequently banned) spirit absinthe, eventually took its toll and from 1897 onwards his health deteriorated rapidly. Alcoholism and syphilis contributed to his early death in 1901 at the age of only thirty-six. Pin-Ups will capture the colour and excitement of this period of economic prosperity and cultural optimism. This was a climate that gave rise to a new mass-celebrity and consumer culture and a golden age of the poster. Public enthusiasm for these images was such that they were removed from walls by collectors, sometimes as soon as they were put up, a process that transformed ephemeral advertising to a collectable form of fine art which bridged ‘high’ and popular culture for the first time. A highlight of the exhibition is the iconic poster Moulin Rouge - La Goulue (1891), on loan from the Victoria and Albert Museum, London. A landmark in Lautrec’s career, this was the first poster he designed and was his earliest experiment with colour lithography. 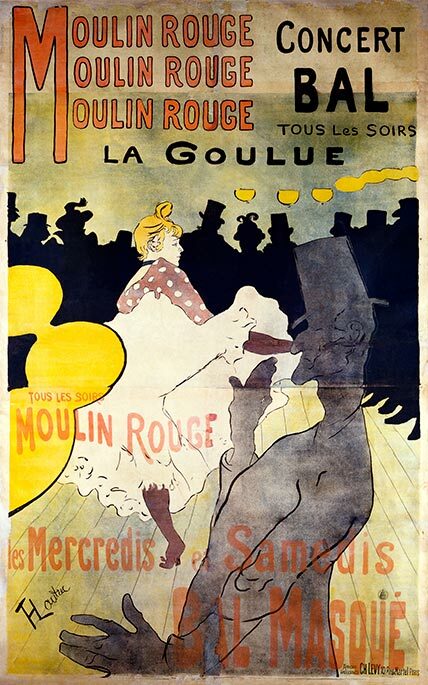 Some 3000 copies of the poster, which advertised the dancer ‘La Goulue’ performing at the Moulin Rouge, were pasted across the streets of Paris, turning Lautrec from a virtually unknown artist to a household name literally overnight. The exhibition will also include a selection of posters by Jules Chéret, whose pioneering designs – characterised by their bright colours and inclusion of glamourous stars – were the first to bring real artistry to the advertising industry. On display will be one of his most famous designs, his poster for the American dancer Loïe Fuller, who took Paris by storm when she debuted at the Folies-Bergère in 1892. Lautrec’s 1892 poster for the nightclub singer and poet Aristide Bruant has become one of the most memorable and frequently reproduced images of the era. A savvy self-promoter, Bruant was one of the first stars to enlist Lautrec to market his act and went on to give the artist more commissions than any other performer. Lautrec’s promotion of the singer made him recognisable across the whole city – so many copies of the poster were pasted on the streets it was said to be impossible to ‘take a step without finding yourself face to face with it’. Another iconic poster on display in Pin-Ups is Tournée du Chat Noir avec Rodolphe Sali by Théophile-Alexandre Steinlen. Featuring the bold silhouette of the black cat that gave the celebrated Montmartre nightclub its name, the poster has become one of the most recognisable commercial images of all time. Pin-Ups: Toulouse-Lautrec and the Art of Celebrity is the first exhibition held at the National Galleries of Scotland devoted to the art of Henri de Toulouse-Lautrec (1864-1901). Paris in the fin-de-siècle was known as the 'city of pleasure’; famed for its cabarets, dance halls and cafés. Most famous of all were the nightspots of the bohemian district of Montmartre, where Toulouse-Lautrec lived, worked and socialised, including the now legendary café-cabarets Le Moulin Rouge and Le Chat Noir. Pin-Ups: Toulouse Lautrec and the Art of Celebrity focuses on Toulouse-Lautrec’s lithographic posters, portfolio prints and illustrations which made stars of Montmartre’s venues and their entertainers - personalities such as Yvette Guilbert, Jane Avril and Aristide Bruant. 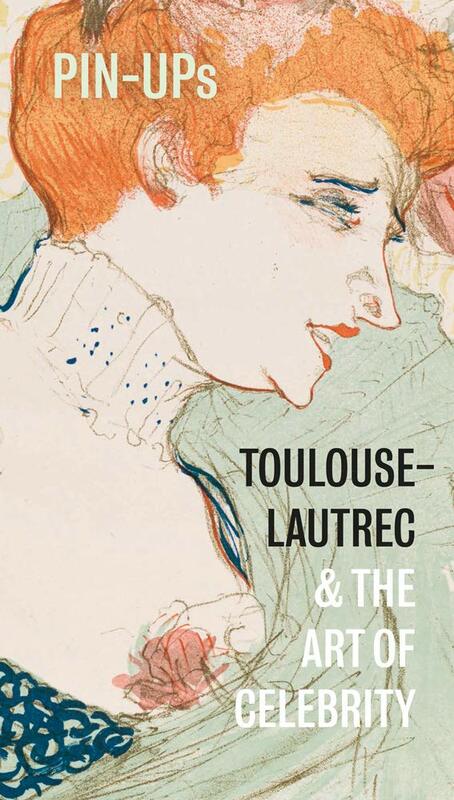 Toulouse-Lautrec’s career coincided with a revolutionary moment in the history of western printmaking - the development of the poster as a means of mass-marketing – and lithography and poster-making were central to his creative process from his first experiments in the medium in 1891 until his death in 1901.